The Web is an almost infinite universe of information. Most of the time, however, locating what you need is like finding a needle in a haystack. Not any more! This gateway to thousands of useful Internet research tools and resources was created as a companion resource for Pam Blackstone's newspaper column. The column is no longer published, but we are committed to continuing to make this comprehensive Internet research resource available for your convenience. 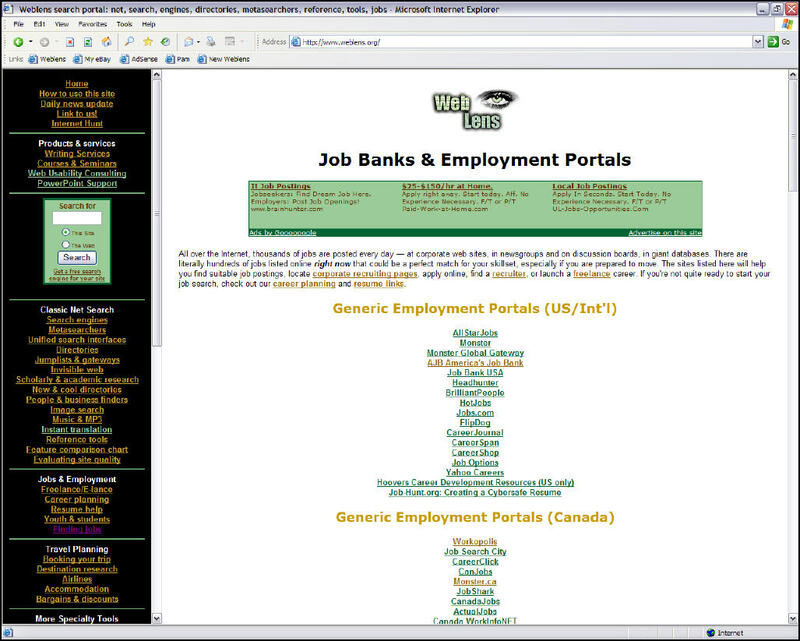 WebLens features links to thousands of the Net's most popular search engines, directories, metasearch tools, music and image searchers, people finders, company locators, reference tools, job databases, recipe archives, scholarly research resources and more. Please feel free to bookmark this comprehensive collection of Net search tools and come back often. Each link in the navigation bar opens a different collection of research tools. From there, you can click any link to explore and/or compare resources. Most linked sites will open in new windows. Close these extra windows to return to WebLens. Happy hunting and may all your searches be fruitful. WebLens has always included advertising, and we make no apologies for that. Revenues from advertising cover hosting and domain renewal fees and allow us to continue offering this free resource. While we have made major changes to the look and feel of WebLens, how the information is organized remains basically the same. There are, however, a few key changes you should know about. Please read on for a summary.